WinOptimizer 11's simple interface and slick design score it points, but much of what this software does is hidden in Window's system settings. Nothing is worse than a slow system. When it takes longer to load a webpage than it does to pull out a book and research your inquiry, well, you know there's a problem. Thankfully, Germany-based software maker Ashampoo specializes in just this kind of problem. Ashampoo's latest release, WinOptimizer 11, is a quasi-all-in-one solution to fixing your Windows PC's problems. Within the app is almost every tweakable setting under the control panel – like disk defragmenter, web cache, cookies and disk encryption tools – all on the same screen. If you had a dollar for every time you heard "Hey, can you look at my machine? It's running really slowly," you could probably buy a small startup. Ashampoo seems to understand this dilemma, and has taken steps to put the power of repair back in your (or a tech-savvy employee's) hands. What and how WinOptimizer does what it does isn't exactly a mystery. Almost every function found within the software, with the exclusion of "Game Booster" and "Live Tuner," is available somewhere in the control panel. So what's the value in WinOptimizer? It's easy and convenient. One minute, you can set a restore point for a less-than-careful coworker; the next, you can clean up the Windows registry to free up system resources. There's no digging and no convoluted menus to dig through. WinOptimizer is not antivirus software, however, and shouldn't be mistaken for it. For the most part, the app played nicely with my AVG Free 2014 software, but by itself doesn't claim to remove any viruses. Maybe additional antivirus and system tuner tools are too much to ask for WinOptimizer's $39.99 (about £23, AU$43) price tag. But, without either, the package is a little incomplete. It's not as if the app is ineffective – the test results show as much – but it doesn't do much more than you can do right now with Windows's built-in tools. 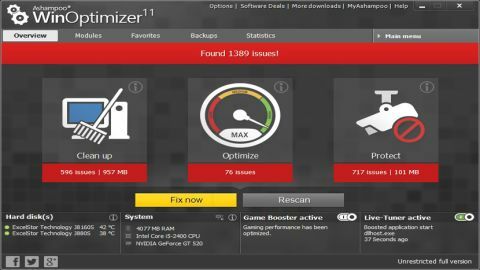 WinOptimizer 11 is compatible with Windows XP, Vista, 7 and Windows 8.1 on "any computer that runs one of the above operating systems at a reasonable speed," according to Ashampoo's website. The software only takes up about 100MB of memory. But, as should be expected, you must run the app as an administrator to make changes. Ashampoo's monetary requirements are even friendlier. The full version of WinOptimizer 11 may be $40, but if you're running a previous version, the eleventh iteration drops to a mere 10 bucks. Still leery? Ashampoo offers a free limited trial on its website.